If you're still on the fence about whether to go for an Xbox One or PS4, a bit of headset news may help you make your decision. 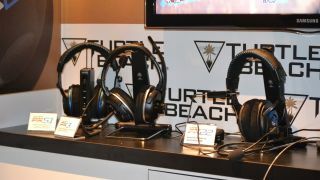 According to Ike Sainoi, a Turtle Beach product manager we spoke with at E3 2013, the company's PS3 headsets should work with the next-gen PS4. "From what we understand, we do believe that our current headsets will work with the PS4 as it stands," Sainoi said. "Of course, nothing is quite concrete yet, but from what we've heard and the conversations we've had, it should work with the PS4 when it comes out." He emphasized that compatibility isn't a complete guarantee yet, but for now it appears Turtle Beach's PS3 headsets are indeed good-to-go with the new console. We're waiting to hear back from the company if headsets designed for earlier Sony systems can plug in as well, and will provide an update when we have more information. As you've probably heard by now, the Xbox One controller features a proprietary audio jack that's incompatible with Xbox 360 and other current-gen headsets, meaning consumers will need to buy a new pair as manufacturers make them. Turtle Beach was the first headset maker to announce a pair of headsets specifically designed for Microsoft's console, the Ear Force XO Seven and Ear Force XO Four. Since then, Polk has introduced the 4 Shot headphones for the console and Microsoft itself has outed its own Xbox One Chat Headset. Turtle Beach's Xbox One headsets come with an adapter that allows them to connect to the console's controller, Sainoi said. We've also asked Sony for more info on the PS4's headset compatibility situation, and will let you know what the company says when we hear back. The console will come with a Sony-made headset, similar to the one produced by Apple. The design right now is single earbud connected to a wire that has a microphone/volume control, Adam Boyes, vice president of developer and publisher relations, said during an E3 roundtable.